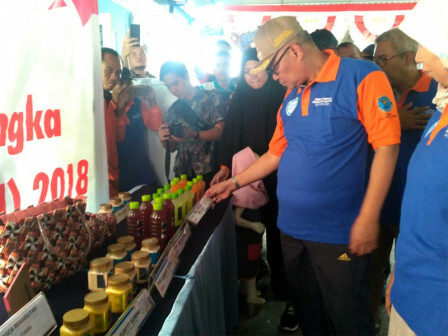 The North Jakarta National Narcotics Agency (BNNK), inaugurates the creative and innovative house for young people in Muara Bahari Village, RW 14 Tanjung Priok Urban Village, Tanjung Priok Sub-district.
" I really appreciate all stakeholders involved in anticipating drug trafficking"
North Jakarta Mayor, Syamsudin Lologau disclosed that the house supported by CSR is a pilot program to overcome drug trafficking and drug abuse with empowerment programs. "I really appreciate all stakeholders involved in anticipating drug trafficking. With this house, users who are aware can return to society and become productive," he expressed. He will synergize the house with the economic empowerment program being developed by Jakarta Provincial Government. North Jakarta BNNK Head, Yuanita Kamelia Sari uttered that it is the development of the Post for Prevention and Eradication of the Abuse of the Muara Bahari Illicit Drug Distribution Prevention and Eradication (P4GN). "We'll open coffee shops, culinary training, recycling, screen printing, etc. The Karang Taruna will manage them," he stated.